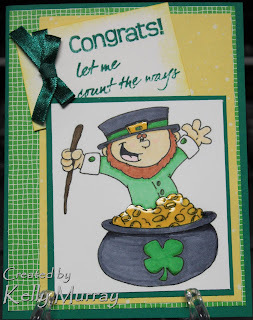 This card makes me happy, I used the leprechaun drawn by Dustin Pike for the Doodle Dragon Studios Challenge #5 - St. Patrick's Day or feeling lucky. 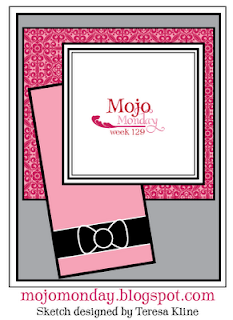 It also works for the challenge at Cute Card Thursday 103 which is celebrations and the sketch is from Mojo Monday 129. I used crystal effects on the gold and the buckle of his hat to give them some shine. I think I will be happier when I am finished my university course, 1 month of heavy reading left to go. I can't wait but then I will have my certification. Too bad my course isn't completed until after the certification deadline for 2010, I won't receive my certificate until spring of 2011. For any that don't know I will have completed 6 years worth of courses to receive my Municipal Administration Certification, basically it is the training required to be an administrator of a municipality, that would be like a county for the States. Aww kelly this card is super, i love the sentiment and story behind this, can't wait to you get that certificate, woohoo!!!! Great job! I love the clear accents on the gold and your take on the sketch! :O) Thanks for playing at Doodle Dragon Studios and good luck! fabulous card! thanks for joining in the fun with us at CCT this week.